Like many other PowerPoint 2004 users who’d grown weary of putting up with the presentation program’s stale feature set and sluggish performance on Intel Macs, I was disappointed when I read last summer that Microsoft would delay the release of the Intel-native Office 2008. Apple unveiled Keynote 4 ( ) just a days after the news of Office’s delayed release surfaced, so I’ve been eager to see if Microsoft would catch up. For the past few weeks, I’ve been putting PowerPoint 2008 through its paces. Although I haven’t reached a final conclusion yet, I can share my initial impressions of what I appreciate and what I don’t like about the new release. The addition of the Formatting Palette in PowerPoint 2004 helped simplify the application’s cluttered collection of toolbars, palettes, and menus. PowerPoint 2008 extends the concept though its implementation of the Toolbox, a dynamic palette that expands the number of operations that you can perform without resorting to menu or toolbar commands. It’s a welcome improvement, although the interface is less consistent than I’d prefer. PowerPoint 2008’s revamped main window also sports a cleaner look, as you can see below. A single customizable view replaces the previous version’s Normal, Outline, and Slide Views. A resizable pane on the left displays the entire presentation, in either the traditional outline format or a new minified slide view that’s similar to Keynote’s Navigator. You can drag slides around to rearrange them, but you can’t indent and hide a group of slides as you can with Keynote. 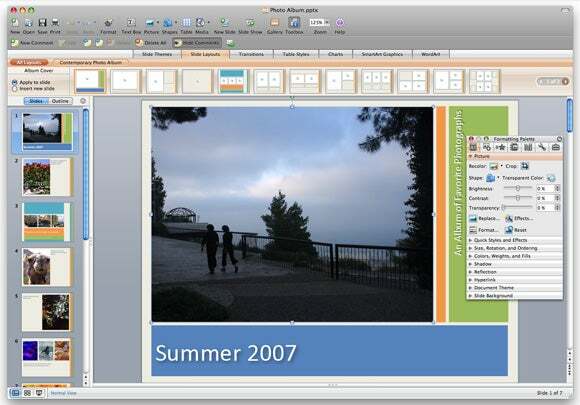 PowerPoint’s adoption of the Office 2008’s Elements Gallery is another addition that lets you apply effects and make changes that occur frequently in the course of designing a presentation. The gallery’s seven tabs include slide themes, layouts, transitions, table styles, charts, SmartArt Graphics, and WordArt. Options in the layouts tab let you specify whether to apply a new layout to selected slides or to insert new slides with the chosen layout, a handy time-saver. Of course, it’s the look of the finished presentation that counts to an audience. Here, too, PowerPoint 2008 builds on the previous version by embracing more of the imaging prowess that is so integral to OS X. Soft drop shadows, transparency, reflectivity, special effects—all either appear for the first time or are more accessible and adaptable than ever before. PowerPoint 2008’s greatly expanded roster of Picture Effects, accessible via the Formatting Palette, is a case in point. With effects that include optical distortions, color adjustments, sharpening, and blurring, PowerPoint lets you achieve impressive results without having to fire up an external image editor. PowerPoint 2008 isn’t perfect, and some limitations are particularly noteworthy given the almost four-year hiatus since its last release. For example, PowerPoint supports QuickTime VR (a feature that Keynote lacks), but it doesn’t let you scrub through movies with a controller. And PowerPoint’s lack of support for animating objects along user-defined paths—an omission that I’ve complained about before—is disappointing. As you can probably tell, I’m impressed by what I’ve seen so far. PowerPoint 2008 has clearly narrowed the gap with Keynote in many areas and surpassed it in some. In my full review, coming with the final release of Office 2008 on January 15, I’ll let you know my overall verdict.